(MP065). Alma Claude Burlton Cull (1880-1931). Watercolour. Signed and dated 1913. Standard size 9 x 16ins (24 x 42cms) approx. Clearly distinguishable here by her single white funnel band (ST VINCENT had two whites, VANGUARD a red on each funnel) and Vice Admirals's flag at the maintopgallantmast , COLLINGWOOD, as flagship, is leading the 1st Battle Squadron (the St Vincents and Bellerophons). When war was declared in August 1914 COLLINGWOOD, together with the majority of the Grand Fleet, slipped quietly away towards northern waters and made her new home the great and remote anchorage in the Orkney Islands - Scapa Flow. The Battle of Jutland, 31st May 1916, saw COLLINGWOOD still with Captain Ley as her captain; and she was still, too, in the 1st Battle Squadron although that was now commanded by Vice Admiral Sir Cecil Burney KCB KCMG, Second-in-Command of the Grand Fleet with his flag in MARLBOROUGH (Captain G P Ross RN). She survived the action without a casualty, firing eighty four 12 inch rounds. She paid off into Reserve in 1919 and was scrapped in 1922. 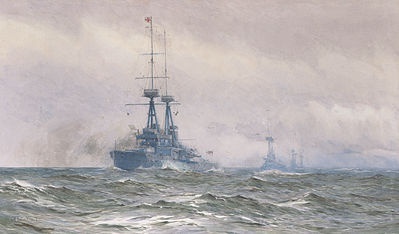 This watercolour of COLLINGWOOD belongs to the RN Trophy Centre and hangs in the shore training establishment of the same name at Fareham, Hampshire.